Deep into Reno-cation week, the idea of this dessert granola came to me. I was sore, I was weak, and I was needing a major pick-me-up at the end of a long day of painting intricate wood trim. Chocolate sounded like the answer. Eric said it was my best idea all week. I dreamed of crunchy and clumpy, warm, chocolaty granola cascading over the top of a bowl of cold Banana Soft Serve. It was just the thing to give me hope that renos would some day come to an end. Because when you’ve been wearing red plaid PJ’s and clogs for a week straight, hope is all you have! 1. Preheat oven to 325F and line a baking sheet with parchment or a non-stick mat. 2. 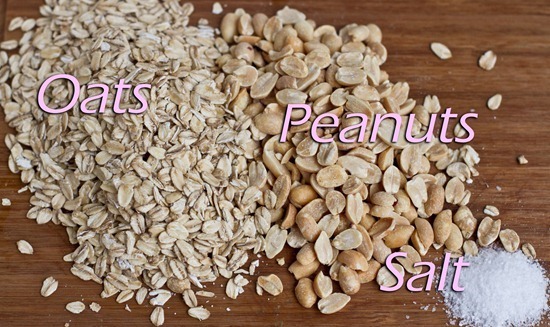 In a large bowl, mix together the dry ingredients (oats, salt, peanuts). In another smaller bowl, stir together the oil, brown rice syrup, and peanut butter. Heat in microwave for about 45 seconds. Stir well and stir in vanilla. 3. Add wet to dry and stir very well until oats are coated. Spread on baking sheet and bake at 325F for 20-25 minutes, flipping once half way through (it will be very sticky, not to worry!). Allow to cool on baking sheet for about 30 minutes before transferring into a container. I store mine in the fridge to keep the chocolate firm. Makes 6 cups. 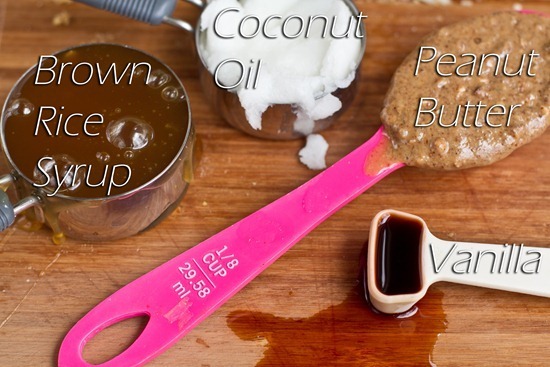 Note: You can probably substitute other liquid sweeteners for BRS and other light-tasting oils for coconut oil. The Brown Rice Syrup makes it quite clumpy though, so I prefer to use that sweetener in granola! Luckily for me (and my sore arms! 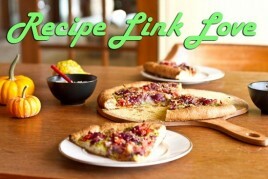 ), this recipe was quick and easy. It only takes 5 minutes to throw this together and pop it into the oven. You know the drill by now…mix the dry ingredients in a large bowl. Then mix the wet (heat up in microwave), and then add wet to dry and stir well. Spread onto your prepared baking sheet. 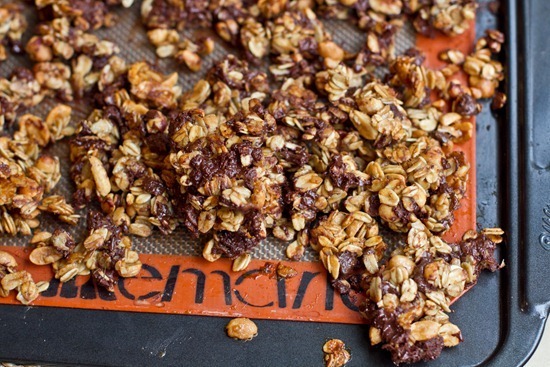 The result is a super clumpy and chocolaty dessert granola….without being too sweet. 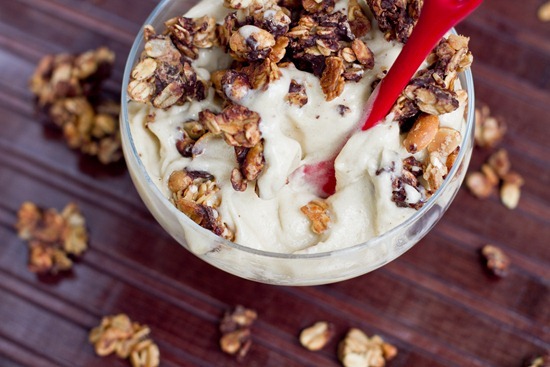 I served some granola warm over Banana Soft Serve and it was to die for! It is also really good on cereal and VOO. I also have an 11-mile long training run to tackle today…after skipping a few workouts for renos. Something tells me this isn’t going to be easy! Wow…good luck with the long run!!! Love the looks of the granola and your hot reno outfit! Oh Angela, this is FABULOUS!!! That looks like a perfect reno treat! Yum! What a great idea to have it with the banana soft serve too. That stuff is good. 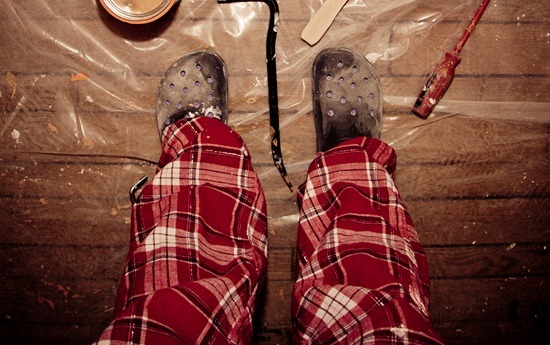 I hate renovations. Hope the light at the end of the tunnel is getting very close for you guys. OMG that looks good… granola harnessed for the power of evil! 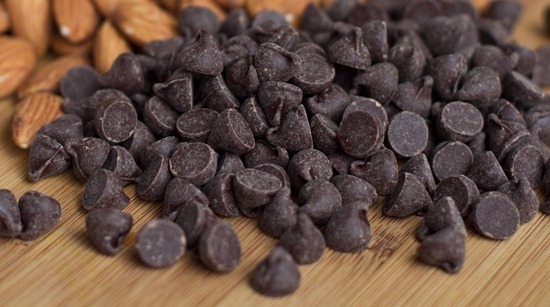 I’m a huge fan of any recipe that includes chocolate chips :) Looks delicious! I have a 10-miler this week – eeeep! :) Slow and steady .. . that’s all you need to ask of yourself. Hope you’re able to do it outside! T-mill long runs are brutal! slow and steady…I love that! I think I need to start reducing the speed of my long runs. I used to speed through mine and then wonder why I was exhausted after 8!! I guess they’re supposed to be slow (though on the shorter ones I do find myself competing against whatever pace/time I had at that last distance – it’s hard not to do!!). I have that exact same problem, especially since I took a break from running for awhile and am just now getting back to the 5k-ish distances. I start out at a slower pace and end up sprinting the last few laps to “beat my times”, even though I know I should give my legs a break on those days! Good luck on the 10-miler! Ta muchly – hopefully it will be outside!! Wow, this does look delicious. Good luck on your training run! 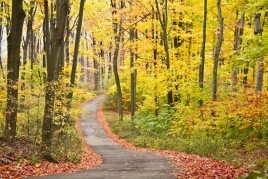 Have fun on your run today! I love wainscoting and I’m sure it looks beautiful! Looks delicious! Your plaid pants are hysterical. WOW! I think this might be your best granola yet! I am in the midst of a cleanse, but if I get gluten-free oats and a good really dark chocolate, I think I can have this …. it looks especially awesome over banana soft serve – great idea!! Can’t wait to see the unveiling of your room – I love dramatic and bold!! 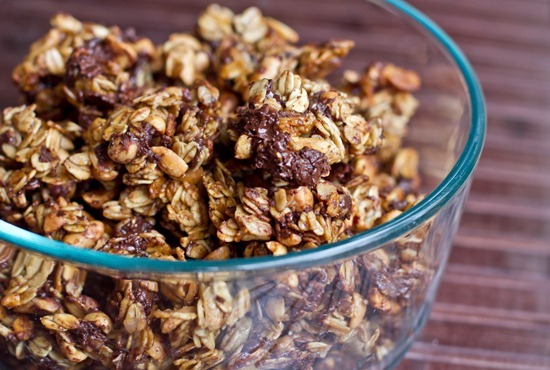 Chocolate granola is one my my favorites! Love how the chocolate melts and coats all the other good stuff so you get a bite of chocolate with every spoonful! I was wondering if you know of a good substitute for brown rice syrup? Could I use maple syrup? Or would I need something thicker like corn syrup? OMG. I cannot wait to go home and make some of that! Thanks! The first word that came to mind when I saw this recipe was: Deadly. Holy moly I don’t know if I could control myself by not eating the entire batch in one sitting. Oooh yum this looks awesome! Here’s the deal: I’ll sit home and eat some dessert granola, and you head out for the run, mmkay? ;) Have a good one Ange! YUM! 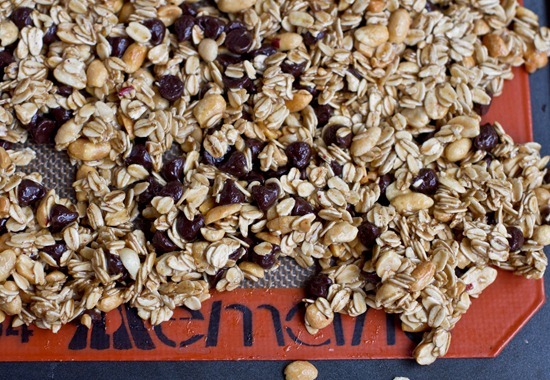 I am such a fan of granola (if you couldn’t tell by the name of my blog!). This looks delightful! I just came in from cleaning the snow off my car and warm chocolate granola sounds like heaven right now. This recipe looks delicious!! I think I will have to make this one! And I voted for you at the Best Health Blog Awards! Good luck!! I can’t wait to see the before and after photos! 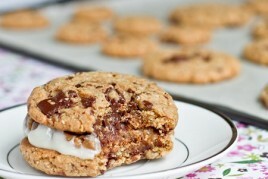 Mmmmm….these look like warm, deconstructed oatmeal cookie chunks!!!! In other words…completely amazing!!! 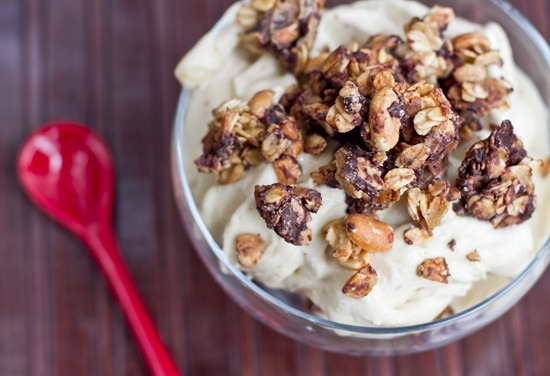 As for this granola…yeah, it’s gonna happen! That is one delicious looking bowl of granola. Yum! Sounds like your reno is coming along and I can’t wait for the big reveal. Sounds amazing!! Could you use coconut butter? Honey roasted peanuts would probably be so good in this. Glad your painting is going well, good luck on your run! i think coconut butter would work, you just might need to use more of it since it is so thick. Let me know if you try it! Oh my god, peanuts in granola. Mmmm. I think i’m going to try this with PB&Co Dark Chocolate Dreams as the pb. Decadent! Oh man, good luck with your 11 miles! I ran 8 on Saturday after going out Friday night.. It was difficult to say the least but I never regret a good workout! And your recipes never cease to amaze me, that granola looks so delish. And even though its “dessert” granola it’s still granola which clearly makes it okay for breakfast too. Yum! I did a similar thing for breakfast, by making peach cinnamon quinoa, and then dotting in dark chocolate. It was basically dessert for breakfast, which is a fantastic start to any Monday morning! Love the plaid pjs too! I have PJ pants just like those! I bet this granola is heavenly. I have yet to make my own granola so far… I need to get on that! This could be one of the best ideas you’ve had yet – that looks so so good! Note to self: buy silpat!! oh my that looks decadent and delicious, good luck on your run today! Mmm that sounds dangerously good! And good luck on your run today! I’m contemplating leaving work to just go home and make this! Looks so good! Perfect fuel for the day before a long run! Yum! I am gonna have to make this soon :) My mileage is starting to pick up too. My half is on the 1st of May, and right now LSD runs are 8 miles. Mmm…excuses to eat more chocolate! 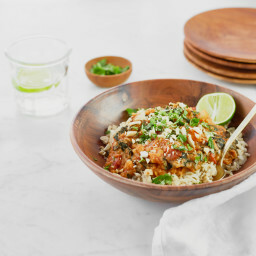 But your lovely lentil recipe from yesterday is calling my name tonight! This looks delightful, and extremely versatile! I can’t wait for warmer weather and banana soft serve! This really looks delicious! 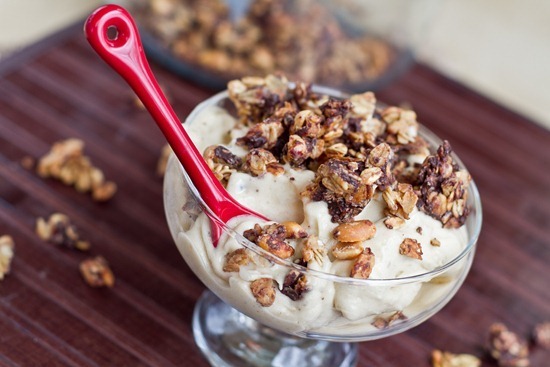 Great idea using it as a topping for banana soft serve. I love the idea of dessert granola. Looks great! Oh, that granola looks so incredible! I think I’m drooling a little over here! 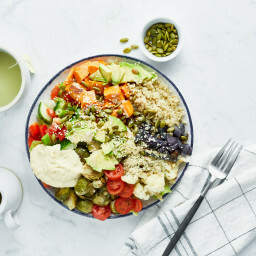 This looks delicous. So glad the renos are going well. Chocolate in granola is my fav. Love that you added the PB, too. A well-deserved treat! Yum! After 8 months in Sweden, where they don’t do the whole chocolate and peanut butter thing (!) I’ve been having mad cravings for anything with that combo. I made a chocolate cake with peanut butter cream cheese frosting and chocolate peanut butter ganache that was so rich that a teeny slice gave me a headache. Seriously, my frontal lobe was burning before I was done my slice. This recipe seems much more reasonable! I can’t wait to try it out. I’m in desperate need of some of this now! This may be the most delicous looking and sounding granola I have ever seen. I will have to try it! Yummy! I’ve had sweet cravings, and this is surely a good (and healthy!) cure for that. Woo! Mosdef will be making this sometime this week. I actually wanted to stop by and thank you again for your motivation for me to continue my running. I have set the date for my first ever half marathon. July 17!! so excited. Thank you!!! I love clumpy granola! What a tasty reward for all your hard work. I can’t wait to see the reveal! Looks fantastic Angela! I’m impressed at this recipe considering all the work you’ve had to put in at the house! I think I’d just opt for take out :). I was gonna keep my own decorating nightmare out of the web alltogether but i figured since you’ve been having a bout, i was gonna too.. Pride is a great motivator! and having a stubborn boyfriend who won’t hire help is another…. i have got to start somewhere right? Good job on the Granola! We don’t really have that sort of stuff in Norway but we eat lads of whole grains. 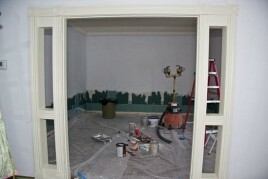 Looking foreward to seeing your finished decorating! omg….amazeballs! This looks so good! Thanks for fun recipes, especially for busy days! You consistently make it fun. i need to make this…STAT! Will definitely need to try this one out! That looks delicious!! I am going to make that ASAP!! Good luck on the 11 miles! You’ll do great! Good luck with the long run! 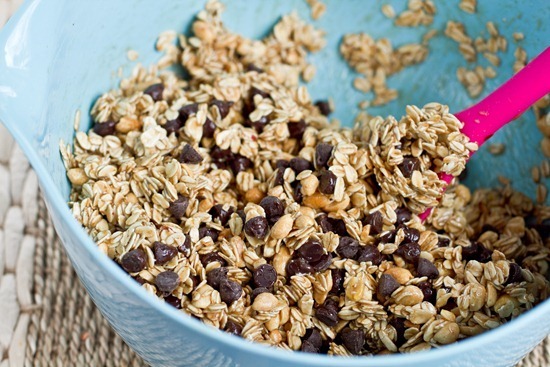 Looking at this granola makes me want to go and make it right now… it looks delish!! So maybe maple syrup would work?? ummm most likely the best granola recipe I have looked at! I can’t wait to make this! Sounds delicious. Can’t wait to try out the recipe. Clumpy granola is the best! So simple. So delish. Another win for Angela! This granola sounds delightful! Whenever a recipe calls for brown rice syrup, I substitute with honey because that’s all I have. I wonder if brown rice syrup makes a significant difference in the texture of the granola? What’s granola without chocoalte clusters? Not soul-soothing, that’s for sure! Peanut Butter + Chocolate + Banana (softserve) = the best combo ever! 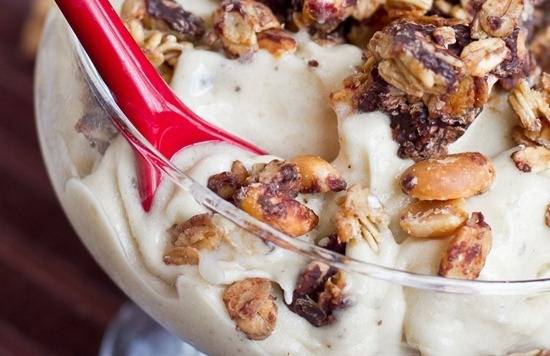 i’ve totally been craving granola — I’m going to have to make a version of this! This sounds so amazing. I tried the nature’s path love crunch granola and didn’t love it so I need to attempt this to actually taste the chocolate! this past week was awful…please send dessert granola ASAP! I love that this recipe is made up of basic/common ingredients! SO DELISH, I’ve had 2 bowls a day since I made it last night. You are da-bomb! Wow this looks amazing and I am DEFINITELY making it! I have become obsessed with making homemade granola, 1-2 recipes/wk! Just wondering if it is very “crunchy”? I prefer mine on the crunchy side more so than chewy? Thanks! Loving your chocolate granola!! Especially in a parfait. I made this last night and I was amazed my family didn’t eat all of it while it was cooling. I had some with greek yogurt this morning for breakfast, AMAZING! Thats what I put mind with…..Even got my BF to eat it! I made this tonight amd OMG it is as good as it looks! Mmm…this looks good. I just posted my some granola on my blog, so I have it on my mind. And this looks so good! Is there anything besides rice syrup that would work for the clumpy effect? Love this. I eat it for breakfast as a treat. :) I used 1 cup of cacao nibs instead of dark chocolate chips, and the sweetness from the brown rice syrup does a really nice job of balancing the bitterness from the pure chocolate! I added some freeze-dried raspberries and strawberries and – voilà, homemade chocolate “Love Crunch” granola (from Nature’s Path). I had a quick question. First, I love all your recipes! Second, I made my own granola last night. I’ve had the chocolate in the fridge all night and this morning. The second my hand touches it it gets SUPER melty. Do you know if theres a way to make this harden a little better? Can you substitute the brown rice syrup? Maybe with maple syrup?